Professional in Business Analysis, PMI-PBA® Certification Training classes in Bellevue-Seattle, Troy-MI, Washington, DC or 100% Live Video Conference. See Live Video Conference Specials. See Testimonials. 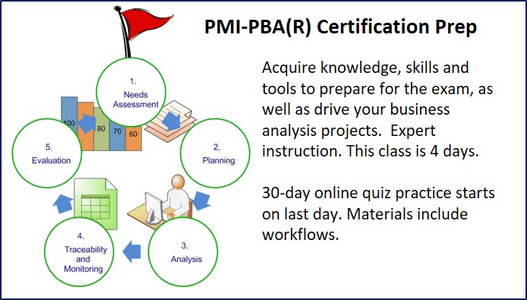 PMI-PBA Certification classes are scheduled on an ongoing basis. PMI® is a Global Registered Education Provider* (R.E.P.) # 3441. Scroll down to see all options. PMP, CAPM, PMI-ACP, PMI-PBA, and PMI are the registered marks of the Project Management Institute, Inc.